A free alpha version is available. Game installation folder is used by the Steam version in rare cases when the game cannot access the primary location. Modify the top two lines so they have your desired resolution width and height, respectively. 2 Available in the alpha versions. Some graphics cards are unable to correctly tell Hacknet what resolution they use. Some older graphics cards crash when scanlines are enabled by default, disabling scanlines in the settings.txt configuration file then starting the game resolves this issue. The developer is working on a permanent solution. 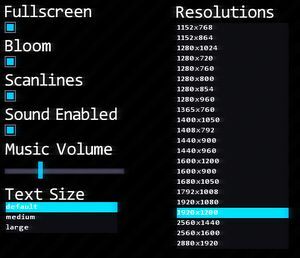 The first two lines are the screen resolution values. The third line contains a boolean value to toggle fullscreen mode. Using 1008 rather than 1024 seems to solve the black screen issue on startup. Adjust resolution accordingly. Right-click Hacknet.exe, then click on Properties. Check Run in 640x480 resolution and Run this program as an Administrator. Uncheck Run in 640x480 resolution once the resolution has been set in the in-game options menu. 2.1, 3.0 2.1 support requires a compatible Mac or Linux OS and a graphics card supporting OpenGL 2.1 with ARB extensions. ↑ 3.0 3.1 3.2 Tested by Expack3. This page was last edited on 18 March 2019, at 16:14.